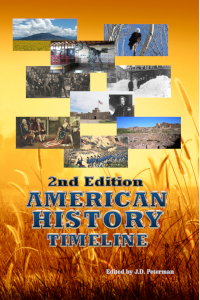 Immigrants streamed into the halls of Ellis Island in the shadow of the Statue of Liberty, they crossed the nation, growing the cities of the east coast, taking part in land rushes, and adding to the experiment that was the United States of America. Don't forget the America the Beautiful Pass, at $80 for one year, the bargain of a lifetime for a family visiting the parks of the National Park Service. Image below: Return of Casey's scouts from the battle of Wounded Knee, 1890-1891. Courtesy Library of Congress. 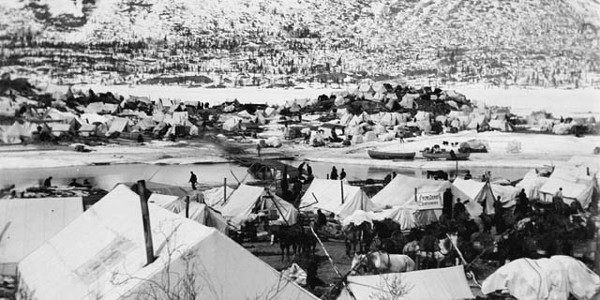 Image above: Mining camp at Bennet Lake, May 1898. Photo courtesy Woodside, H.J., 1858-1929. Library and Archives Canada. 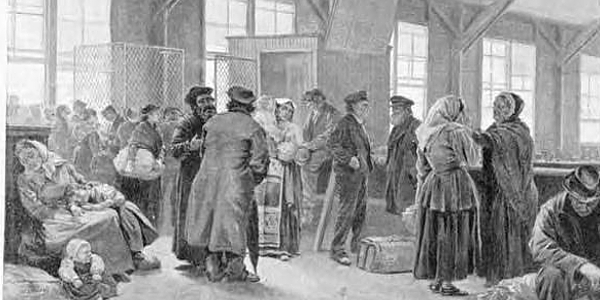 Right: Engraving of the immigrant scene at Ellis Island, New York harbor. Courtesy Library of Congress. September 27, 1890 - Rock Creek Park in Washington, D.C. is created when President Benjamin Harrison signs legislation creating natural preservation in the wooded valley within urban District of Columbia. December 29, 1890 - The Battle of Wounded Knee, South Dakota, occurs in the last major battle between United States troops and Indians. Hundreds of Indian men, women, and children are slain, along with twenty-nine soldiers. March 3, 1891 - The 51st Congress of the United States passes the International Copyright Act of 1891. May 20, 1891 - The first showing to a public audience, the convention of the National Federation of Women's Clubs, of Thomas A. Edison's new strip motion picture film occurred at Edison's West Orange, New Jersey laboratory. Later that year, Thomas Edison would patent the radio. January 1, 1892 - Ellis Island, in New York Harbor, opens as the main east coast immigration center, and would remain the initial debarkation point for European immigrants into the United States until its closure in 1954. More than 12 million immigrants would be processed on the island during those years. Ellis Island replaced Castle Garden, in Manhattan, as the New York immigration center. November 8, 1892 - Grover Cleveland returns to the presidency with his victory in the presidential election over incumbent President Benjamin Harrison and People's Party candidate James Weaver. Weaver, who would receive over 1 million votes and 22 Electoral College votes, helped defeat Harrison, who garnered only 145 Electoral College votes to Cleveland's 277. May 1, 1893 - The 1893 Chicago World Columbian Exposition, held on 686 acres and known affectionately as the White City, opens to the public. The world's fair hosted fifty nations and twenty-six colonies. Known today as the architectural wonder that saw replication of the styles of its white buildings throughout the United States in many public buildings for years to come, as well as the public initiation to the Ferris Wheel, a behemoth construction that held up to 2,160 riders. May 5, 1893 - The New York Stock Exchange collapses, starting the financial panic of 1893. It would lead to a four year period of depression. October 30, 1893 - The Chicago World's Fair closes after 179 days of public admission and over 25 million in attendance. It cost $27,291,715 and included a moving sidewalk and the first sighting of picture postcards. 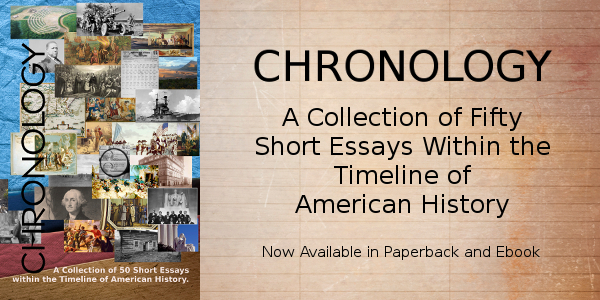 Considered by many historians as the greatest national event in American history through the year 1900. April 14, 1894 - The first public showing of Thomas Edison's kinetoscope motion picture is held. Edison had invented the process seven years earlier. April 29, 1894 - In a march of five hundred unemployed workers into Washington, D.C. that had begun on March 25 in Massillon, Ohio, leader James S. Coxey is arrested for treason. December 27, 1894 - Shiloh National Military Park in Shiloh, Tennessee is created to commemorate the field of the two day battle in April of 1862. It was one of the largest engagements between Union and Confederate forces in the western theatre of the U.S. Civil War. 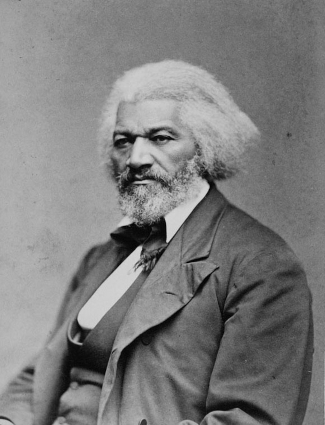 February 20, 1895 - Frederick Douglass, the ex-slave who rose to prominence in national politics as a civil rights advocate and abolitionist during Civil War times died at his home in Washington, D.C.
May 18, 1896 - Plessy versus Ferguson decision by the Supreme Court states that racial segregation is approved under the "separate but equal" doctrine. June 11, 1896 - Funds are appropriated by legislation signed into law by President Grover Cleveland to acquire the house across from Ford's Theatre. This home was the location where Abraham Lincoln died from his wounds in the theatre assassination by John Wilkes Booth. August 16, 1896 - Gold is discovered by Skookum Jim Mason, George Carmack and Dawson Charlie near Dawson, Canada, setting up the Klondike Gold Rush which would cause a boom in travel and gold fever from Seattle to prospector sites surrounding Skagway, Alaska. December 10, 1896 - The New York City Aquarium at Castle Clinton opens on the tip of Manhattan Island. Castle Clinton, or Castle Garden, had been previously utilized in many capacities during the history of New York City; as a fort, entertainment location, and immigrant depot. April 27, 1897 - The tomb of Ulysses S. Grant is dedicated in New York City, twelve years after his death. September 1, 1897 - The era of the subway begins when the first underground public transportation in North America opens in Boston, Massachusetts. February 15, 1898 - The rallying cry, "Remember the Maine" is struck when the United States battleship Maine explodes and sinks under unknown causes in Havana Harbor, Cuba, killing two hundred and sixteen seamen. The sentiment becomes a rallying point during the coming Spanish-American War. February 4, 1899 - Filipino independence fighters under leader Emilio Aguinaldo begin a guerrilla war after failing to gain a grant of independence from the United States, which they had been fighting for from Spain since 1896. February 14, 1899 - The United States Congress approves the use of voting machines in federal elections. March 28, 1899 - August Anheuser Busch, Jr., grandson of founder of the Anheuser-Busch brewery company, is born. Known for beginning use of Clydesdale in company logo and for buying the St. Louis Cardinals. Also born this year are Al Capone, January 17, and Fred Astaire, May 10. September 6, 1899 - The Open Door Policy with China is declared by Secretary of State John Hay and the U.S. government in an attempt to open international markets and retain the integrity of China as a nation. An immigrant family on Ellis Island, March 1917. Courtesy Library of Congress. 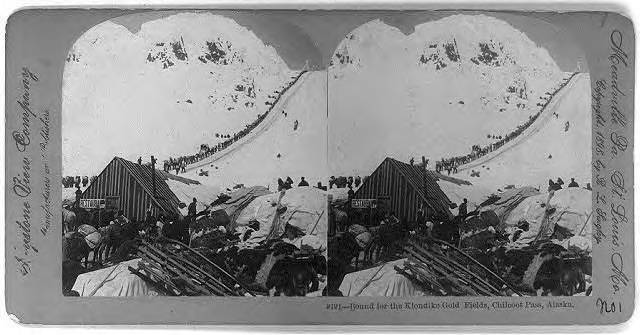 Chilkoot Pass, Klondike Gold Rush. Courtesy Library of Congress.